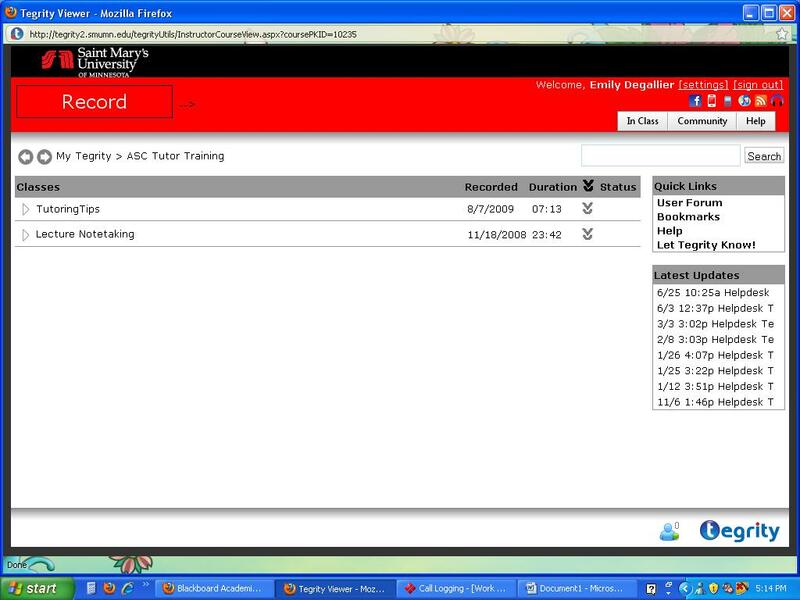 STEP 2: Select the desired course (or organization) that the recording is located in. STEP 3: Once in the course, on the left hand side of the screen is a list of buttons and links to information related to that course. Click “Tegrity Classes”. ** This should open a pop-up window called the “Tegrity Viewer”. If it does not come up, check your browser options/preferences and make sure your pop-up blocker is turned-off. Or, a yellow bar may appear at the top of your screen asking you to “Run Active X Control”. Click “Allow”. STEP 6: Above are the various chapters of the recording. Click on any of them to start from that point in the recording. STEP 7: Once you click play the viewer will take a moment to load the recording. What are the requirements for viewing a Tegrity recording? Can I delete a bookmark?